The past two weeks had been very tedious for me and my colleagues in the office as we were involved in three major programs that had to be implemented one after another. We had never carried out programs in such a quick succession before and the preparatory tasks and other arrangements completely drained us out. First we had the capacity building training for out-of-school youth from 15-19 March in collaboration with the Institute of Management Studies in four Youth Centers: Trashigang, Phuntsholing, Gelephu and Thimphu Youth Centers during which I was fully responsible for coordinating with the regional Youth Centers to arrange the training. Then we had to coordinate the conduct of a Training of Trainers (TOT) workshop for another batch of out-of-school youth and Youth Center Managers in Thimphu from 24-28 March 2016. I think there is nothing more challenging than bringing youth from other Dzongkhags especially keeping in mind the current financial rules that allow us to pay the DSA of only Nu.150 per day to each youth. Nevertheless, the TOT workshop ended successfully as planned and then we had a 2-day youth interaction program in Thimphu with Parliamentarians which started yesterday and successfully ended today. Yesterday, we had a fruitful consultation workshop with over 44 youth both students and out-of-school youth and discussed various youth concerns to be presented to the Members of Parliament. 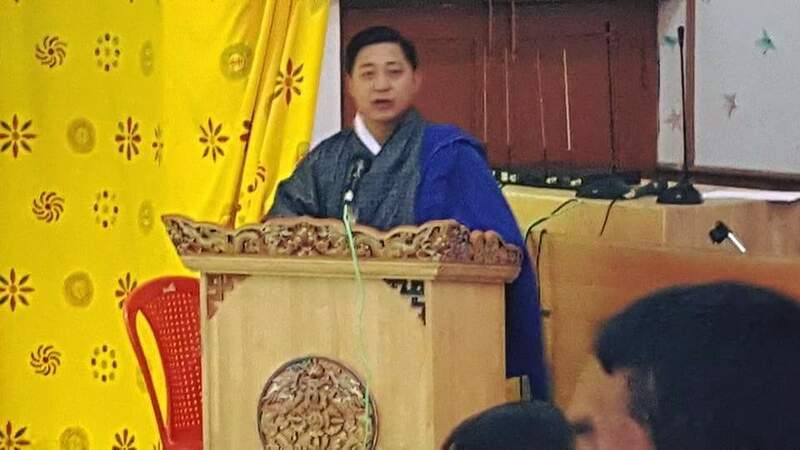 The participants were shared the recommendations of the National Youth Forum conducted in December 2015 during which over 140 youth from different Dzongkhags had participated. In addition to that, the participants also discussed and identified the most important issues to be further discussed with the Members of Parliament. Today’s program went on very well. The Hon’ble Members of Women, Children and Youth Committee of the National Assembly were invited to interact with over 50 youth. The youth participants shared the summary of yesterday’s consultation workshop and the Committee also enlightened the house on the mandates and some of the most important initiatives of the Committee in the areas of youth development. The sessions were very interactive as both the participants and the Hon’ble Members of Parliament could exchange a lot of new ideas and concerns. It was a very good opportunity for our youth to interact with the Members of Parliament and understand how the Committee represents them in the parliament. On the other hand, it was also a good opportunity for the Hon’ble Members of Parliament to interact with youth and get a better understanding of their needs and concerns to be mindful of while framing new youth related policies and laws in the parliament. I was amazed by the quality of questions our youth asked the Parliamentarians and how they responded to them. It was really a meaningful dialogue I guess. When the program finally ended, I felt as though I have got rid of a heavy load from my head that had been weighing me down over the past couple of weeks. We all celebrated in spirit the successful completion of those three major activities within such a short period of time despite being a very small team of officials in the Division. Finally, I would like to heartily thank the Hon'ble Members of Women, Children and Youth Committee for kindly consenting to our request to interact with our youth today. We also would like to thank all the youth for your active participation and contributions to the discussion. Of course, my special thanks also goes to all my colleagues in the office for your kind support especially during this final program which I coordinated. Without your help and support, it could not have been successful. But no matter how busy I remained in the office during the day, I never got tired to update my blog in the evening at home. Over the past two weeks, I have managed to publish a number of posts because I hardly get tired of thinking and writing. In fact, I update my blog mostly in the evenings or early mornings because that is when I am usually mentally active. More importantly, blogging holds me back from drifting into sleep as soon as I finish my dinner because usually I can’t remain awake for long after dinner if I don’t have anything interesting to do. Then I often get up too early in the morning and again blogging helps me spend my fresh hours more meaningfully. So it seems blogging has now become part of my private life. The workshop which was attended by all the youth participants and relevant authorities would definitely bring closer rapport and better understanding. This is essential to bring the development to greater heights. I do share the same passion like you when it comes to blogging. My objective of writing my blog is to awaken my readers about leading meaningful lives daily besides sharing anything that is interesting overseas. I also prefer to read other blogs to learn more to enrich my knowledge. I have been amazed by all the blogs written by Bhutanese as their English is very good with creative flair in writing. Sometimes i was curious whether Bhutan bloggers have similar interests to read foreign blogs too? Thank u so much for your comment. Yes, I do read a lot and regularly check out others' blogs. I have checked out yours. I too love your writing. Let us keep in touch through our blogs and motivate each other.